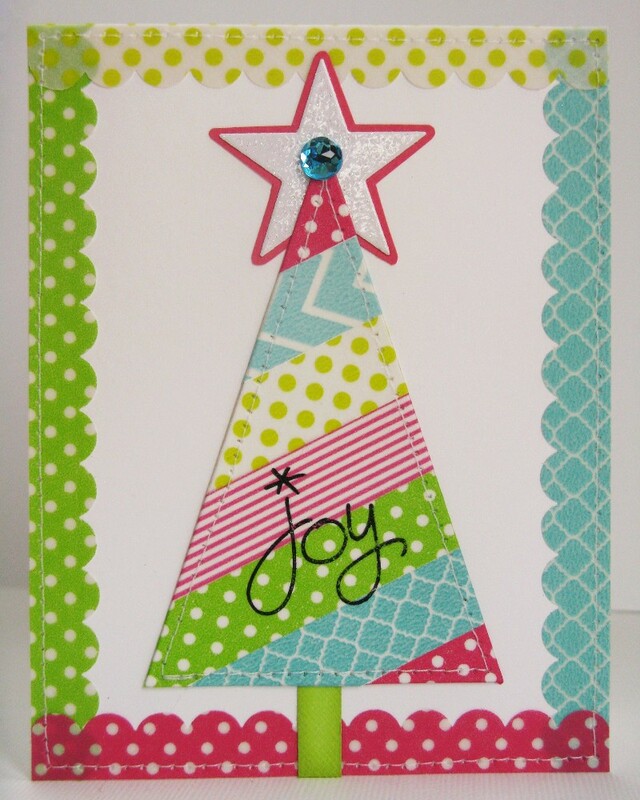 To form the body of my tree I used Spellbinders Pennant die to cut a pennant from white cardstock which I turned upside down. I then set to work covering it in brightly colored, non-traditional colors set at an angle. Somehow this sort of reminds me of the metal Christmas trees (at least in colors) that are in the Charlie Brown Christmas special. Since the washi tapes are a bit slick in texture I made sure to stamp my sentiment with Stazon Ink. To create my washi tape punched borders, I mounted the tape onto vellum strips to cover the stickiness and give the tape stability before punching, which also allows the tape to maintain it's translucent qualities (I have Kathy Martin to thank for this awesome tip). Since the tape is sheer and I didn't want my adhesive to show, I chose to stitch them on around the perimeter of my card. Thank for stopping by. I hope I've inspired you to pull out your washi tapes and take them for another spin.